Welcome to your new fitness obsession: goat yoga. 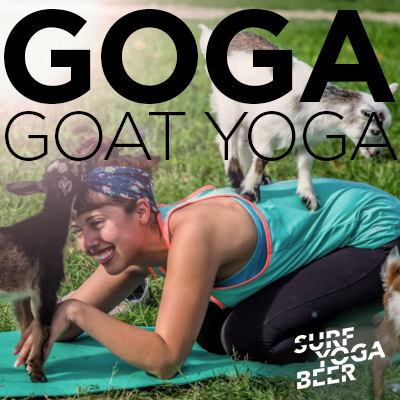 GOGA is like yoga... but with baby goats climbing on you while you chaturanga. Goats are affectionate and social and are guaranteed to make you smile and laugh during your sweat session. Get ready to ditch the city and namaste with some new furry friends. We will depart from Union Square at 8:30AM on March 30th. SYB will provide transportation. GOGA will take place from 10AM-12PM with enough time for all of your insta-worthy pics. We will then go on an afternoon hike and stop to eat lunch along the way. Bagged lunches will be provided by our partners at Salud! After the hike we will stop at a brewery to end the day with craft brews and bites before our drive back to the city. *Space is limited to 26 spots.